Who will hold the Iron Throne? You decide! 18 blind-packaged mini-figures based on Game of Thrones. Watch for random chase figures you can collect! 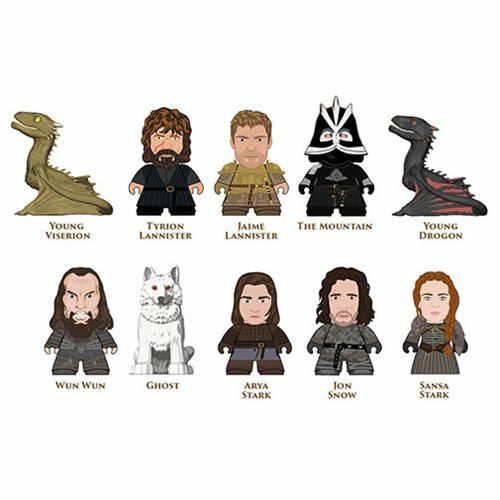 You decide who holds the Iron Throne with Titan Merchandise's series of mini-figures based on Game of Thrones and the battling families of Westeros! The Winter is Here Collection includes all your favorites, from Jon Snow and the Mother of Dragons to Brienne and Tormund to the icy White Walker and Night King. Which ones will you get? Each blind-packaged mini-figure measures approximately 3-inches tall, and there are random chase figures for you to hunt and collect!